Family vacations are about fun and togetherness, yet planning them can often be a stressful experience. We offer a custom, all-inclusive Costa Rica Family Vacations at Blue Surf. When deciding on the location, amenities and activities, you need someone with experience in Santa Teresa. Allow us to custom build your trip or you can choose one of our pre-built packages. Blue Surf is the place for families who already surf, as well as families who wish to learn this fun sport together. The ability or desire to surf is definitely not a prerequisite to stay with us. However, we can guarantee you will want to continue your surf skills and make a return trip to show your progress! Let us do the work while you have all the fun! Providing an assortment of activities during your stay equates to a fun family vacation with something for everyone. The best part is allowing us to plan and arrange everything for you! This guarantees a stress free Costa Rica Family Vacation allowing you to sit back and have fun with your family. Finding a surf destination with more than just surfing as an activity is important for your family vacation. A variety of activities during your stay are available. Enjoy a day trip Snorkeling or scuba diving and playing on a private island. A delicious lunch is provided and everyone will leave with special memories from this day. One of the most popular tours is Horseback Riding. Here you will see the countryside from the back of a gentle, Costa Rican horse ending the tour on the beach at sunset. Let us not forget about Ziplining where you will soar above the treetops. There is a beautiful waterfall for you to experience. Are you adventurous enough to jump into the waterfalls? Let one of our experienced tour guides take you through Cabo Blanco Nature Preserve where you will see butterflies, monkeys and a variety of birds. Be sure to bring your camera! And of course, we cannot forget about everyone’s favorite–surf lessons! Let our experienced surf instructors provide you with fun and safe surf lessons. 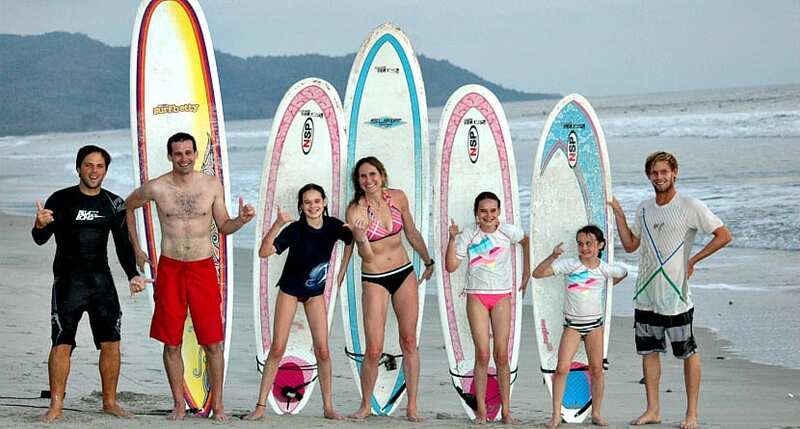 OR if you are an experienced surfing family, let our surf guides take you to a secret spot where your Costa Rica Family vacation will be unforgettable. We recommend 2 types of accommodations for your Costa Rica Family vacation, no matter if your family is big or small, we can arrange your stay at Blue Surf Sanctuary or Blue Surf House (see more info below). Blue Surf Sanctuary is a 4 bungalow boutique hotel. Here you can rent either one bungalow or all four depending on the size of your family. If you rent all 4 bungalows, we can sleep up to 16 guests. Our beautiful Blue Surf House is the perfect option if you are looking to house everyone under one roof. It is a spacious, 5-bedroom villa with a private pool and perfect mix of indoor and outdoor spaces. It sleeps 14 with plenty of room to stretch out. If you wish, we can hire a cook to prepare fresh and delicious meals during your stay. Planning your time here is included in our rate, so we are here to help every step of the way. Our team of experts will make this Costa Rica Family Vacation a trip to remember!